Amy Lyon, born ca. 1761 at Ness on the Wirral peninsula, was the daughter of a blacksmith from Cheshire and a servant woman, Mary Kidd. She was brought up by her grandmother in the Welsh county of Flintshire. Endowed with great beauty and a sort of animal magnetism, the illiterate peasant girl migrated to London in 1778. Under the assumed names of Emily Lyon and Emma Hart, she worked as a domestic and allegedly as a prostitute in the quack Dr. Graham's Temple of Health. Despite the uncouthness of her language and her thick Welsh accent, she attracted several rich and influential lovers, among them Charles Francis Greville, the son of the Earl of Warwick, with whom she lived for several years. At this time she began modelling for some of England's great painters; she eventually sat to Reynolds, Hoppner, Gavin Hamilton, Lawrence, and especially George Romney, in whose studio she posed for some forty odd portraits and fancy pictures. This Mrs. Hart, one of the most beautiful creatures I have ever seen, is of obscure origin. It is apparently to please her benefactor, a great amateur of the arts and of Antiquity that Mrs. Hart learned to execute these different attitudes. She dresses in the Greek or Roman style, bedecked with flowers or covered with a veil and thus gives a living spectacle of the masterpieces of the most famous artists .... One must see her to realize how well this beautiful woman can cast a spell of illusion. Uoseph Thomas, Comte d'Espinchal, Journal d'emigration, Paris, 1912, pp. 88-89). Emma married Sir William in England in September of 1791. As Lady Hamilton, she was able to ingratiate herself with the wily Queen Maria Carolina of Naples (fig. 34), who made use of her in order to implement her anti-French policies. In 1798 she began her love affair with Admiral Viscount Horatio Nelson (1758-1805). She returned to England with her husband and her lover in 1800, and the next year gave birth to Nelson's daughter, Horatia. Emma's life had a tragic conclusion. Hamilton and Nelson died within two years of each other. Afterward, she threw off all propriety, becoming obese and an alcoholic, and living far beyond her means. Vigee Le Brun saw her in this condition during her visit to England between 1803 and 1805. Unable to pay off the enormous debts she had contracted, Lady Hamilton was finallv imprisoned in 1813 for insolvency. Upon her release, she fled to Calais where she died on January 15, 1815. Emma Hart was perhaps the most beautiful of the famous hetaeras known socially by Vigee Le Brun. Her special gifts as an actress and mime inspired the artist to paint three portraits of her in the historical vein. Yet personally Mme Le Brun found the Englishwoman coarse, vulgar, and altogether antipathetic. Inveterate admirers of Lady Hamilton must look on the following comments with a jaundiced eye: "Lady Hamilton was not very intelligent, although she was exceedingly mocking and denigrating, to the point that these faults were her only means of conversation. But she was cunning, and this helped her to snare a husband" (Souvenirs, 11, 93). Countess Skavronsky ( cat. no. 30) had given only one sitting when Lord Hamilton persuaded Vigee Le Brun to undertake the portrait of his "hostess": "I painted Mrs. Hart reclining near the sea, holding a goblet in her hand. Her handsome face was very animated and was in complete contrast with that of the Countess. 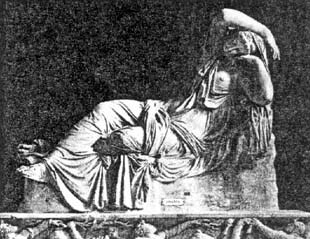 She had a great quantity of beautiful chestnut hair which could cover her entirely, and as a bacchante, with her hair spread out, she was admirable" (Souvenirs, 11, 87). In a news bulletin from Rome, the Director of the Academie de France, Menageot, advised his superior, d'Angiviller, that the portrait had been finished by mid-July: "Le ministre d'Angleterre, le chevalier Hamilton, a ecrit icy qu'elle vient de faire pour lui un des plus beaux tableaux qu'il ait vu [sic]." (The English ambassador, Lord Hamilton, has written here [Rome] that "[she] has just painted for him one of the most beautiful pictures he has seen.") (Bulletin of July 21, 1790, in A. de Montaiglon and J. Guiffrey, Correspondance des Directeurs de I'Acad6mie de France d Rome avec les Surintendants des Batiments, Paris, 1906, XV, p. 437). It often happens that hints may be taken and employed in a situation totally different from that in which they were originally employed. There is a figure of a Bacchante leaning backward, her head thrown quite behind her, which seems to be a favourite invention, as it is so frequently repeated in basso-relievos, cameos, and intaglios; it is intended to express an enthusiastic frantic kind of joy. This figure Baccio Bandinelli, in a drawing that I have of that Master of the Descent from the Cross, has adopted (and he knew very well what was worth borrowing) for one of the Marys, to express frantic agony or grief. It is curious to observe, and it is certainly true, that the extremes of contrary passions are with very little variation expressed by the same action." (The Literary Works of Sir Joshua Reynolds, ed. H. W. Beechy, London, 1890, II, p. 54). London, 1981, cat. nos. 45, 46, 55, and 56). 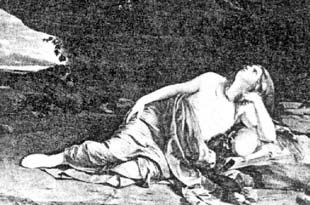 A contemporary adaptation of the supine pose in French portraiture, with similar mythological connotations, is Joseph Siffr@de Duplessis's Duchesse de Chdrtres of 1778 (Musee Conde, Chantilly; illus. in J. Thuillier and A. ChAtelet, French Paintings from Le Nain to Fragonard, Geneva, 1964, p. 218). Mme Le Brun complained that Hamilton haggled over the price of the portrait until she agreed to paint it for a mere hundred louis. But then again, she said, he had a nasty habit of making a profit on the works of art he commissioned, and the arts protected him more than he ever protected them. Along with fourteen other portraits of Emma, the painting hung in the Hamilton's Neapolitan residence, the Palazzo Sessa, and was recorded there by James Clark in an inventory taken between October and December 1798 when the entire collection was being prepared for shipment to England. (Original ms., Fitzwilliam Museum, Percival Bequest; reprinted in B. Fothergill, cited below, p. 437). The portrait did not appear in either of the two Hamilton sales which took place at Christie's in the spring of 1801 and was sold by private treaty to Lord Nelson in March of 1801 for the sum of 300 guineas (see Documents below). It was Nelson's favorite portrait of Emma. Later, to help pay off her debts, Emma included it in Nelson's estate sale in 1809. 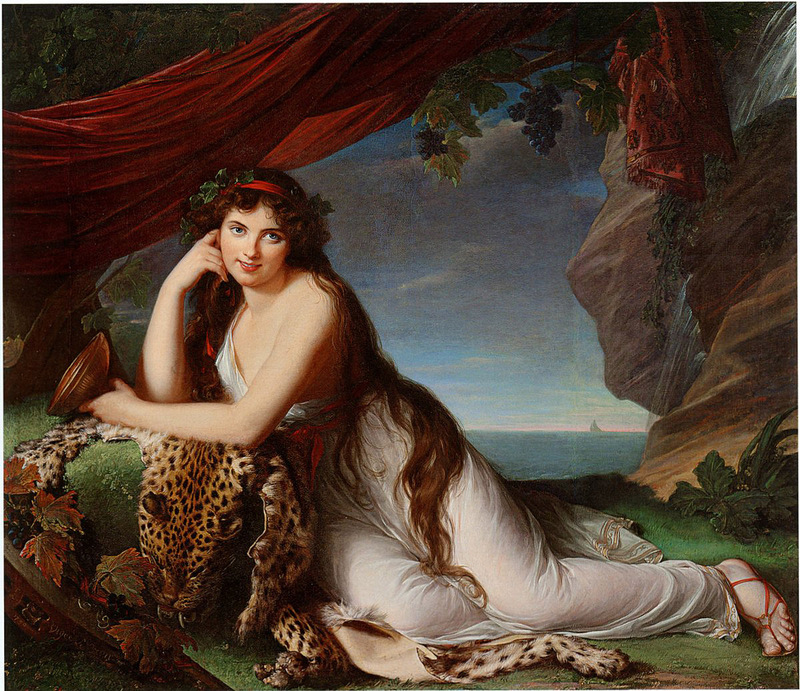 In the auction catalogue, it was described as the "Portrait of Lady Hamilton whole length as a Bacchante recumbent in a landscape, composed in fine poetical taste, a very capital specimen of the talents of this highly accomplished artist." In March of 1803 Hamilton commissioned Henry Bone to copy the portrait in miniature. That work, now in the Wallace Collection, London, was bequeathed to Lord Nelson in a codicil to Hamilton's will dated April 16, 1803 (see The Collection of Autograph Letters and Historical Documents formed by Alfred Morrisson: The Hamilton and Nelson Papers, XI (1798-1815), n. 1., 1894, P. 424). Vigee Le Brun's two other portraits of Emma Hart represent her as a sibyl (see cat. no. 36) and as a dancing bacchante (Lady Lever Art Gallery, Port Sunlight). My Dearest friend I have bought your picture for I could not bear it should be put up at auction and if it had cost me 300 drops of Blood I would have given it with pleasure. I think the picture had better be delivered to Mr. Davis or packed up and I have charged him not to mention it or to show it to any Soul breathing. I desire it always to hang in my Bed chamber and if I die it is yours. After we get into the Baltic it may be very dangerous writing for if the Vessel is taken which is very probable my correspondence will certainly be published. Therefore I shall never sign my name in future. Heavens Bless You. Send my letter & order to Mr. Christie, directly. PROVENANCE: Painted for Sir William Hamilton; his collection, Palazzo Sessa, Naples, until 1798; sold by him for L300 in March of 1801 to Horatio Nelson, Merton; bequeathed by him to Emma, Lady Hamilton; sold by her, London, Christie's, Sale of Sir William Hamilton and the Lord Viscount Nelson, deceased, from his Lordship's Late Villa at Merton, June 8-10, 1809, lot 32; later, collection of William Chamberlayne; by direct descent to Tankerville Chamberlayne and the present owners. EXHIBITIONS: London, The Grafton Galleries, Exhibition of a Special Selection from the Works by George Romney, Including a Few Portraits of Emma, Lady Hamilton, by Other Artists, Summer 1900, no. 109; Iveagh Bequest, Kenwood, Lady Hamilton in Relation to the Art of Her Time, July 18-October 16, 1972, no. 50. REFERENCES: Souvenirs, II, 86-88, 369; Connoisseur, XII, July 1905, p. 188, ibus. p.165; Helm, , pp. 113, 201; C.H.Dorr, "An Unknown Portrait of the Famous Lady Hamilton in the Role of Bacchante...," Arts and Decoration, 1923, p. 17; W. P. Gibson, Wallace Collection Catalogues ... Miniatures and Illuminations, London, 1935, pp. 11-12, cited under no. M 12; 0. E. Deutsch, "Sir William Hamilton's Picture Gallery," Burlington Magazine, LXYXII, February 1943, pp. 37, 41; B. Fothergill, Sir William Hamilton, Envoy Extraordinary, New York, 1969, pp. 299, 437; G. Reynolds, Wallace Collection: Collection of Miniatures, London, 1980, pp. 312-313, cited under no. 306.